Ok, I’ve been away from the blog for a while, but I’m finally back to finish up some old posts that have been sitting waiting for further editing, and to add some new ones about some new, exotic locations I got to visit it 2012!! 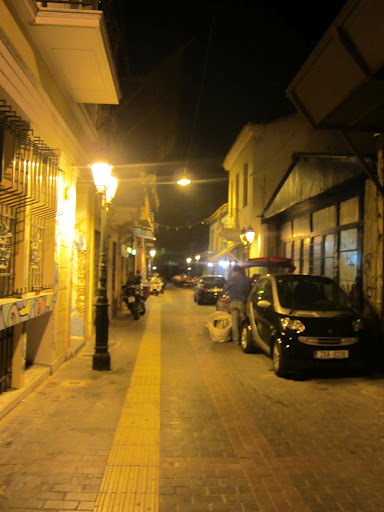 Back in July, I had planned for 4 days in Athens, before meeting up with friends in Crete for a wedding. My friend’s wedding gave me the perfect excuse to go and explore the land of Plato and Aristotle, sort of a pilgrimage for a closet philosophy nerd like me! Unfortunately, due to some travel complications, I lost a day there, but I arrived ready to explore and excited to see as much as I could in 3 days! 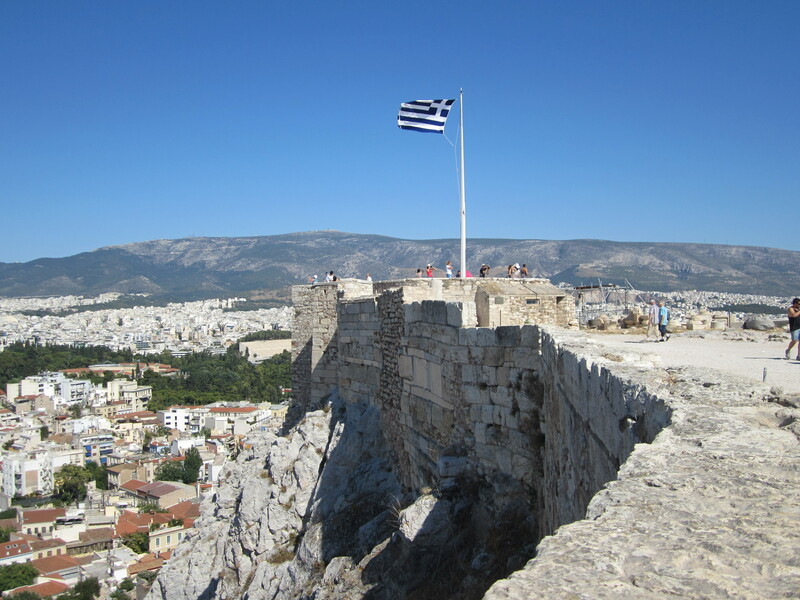 My first trip to Greece fell during a period of financial insecurity and some degree of social unrest, as there was disagreement about how the government debt crisis should be handled. Every person I spoke with had a different opinion about what should be done, and what the future held for Greece. The result? Public protests, high unemployment, and low tourism. What did that mean for my visit? Low rates at a nice hotel, no lines at any of the tourist destinations I visited, and no difficulty getting a table wherever I wanted to eat. my new Greek friends, who said that there was a time where all the restaurants would have been full and the sidewalks crowded. Instead, seats were readily available at all the cafes and restaurants, and restauranteurs were trying to coax us into many of the establishments that we passed. We settled on one taverna, and my new friends ordered up some traditional Greek dishes like Dolmadakia (grape leaves stuffed with rice and vegetables), Greek salad, olives, souvlaki (grilled meat, usually pork, I believe), tzatziki (yogurt with cucumber and garlic), and feta cheese with flat bread. We had some Greek beer called Fix, and it was pretty good. All in all, a great first night in Athens!! The benefit to having local friends to show you around is that first time visitors would be most likely to hit the “usual” tourist attractions on their first full day in town, while if you have local guides, they can take you to places that are a little more off of the beaten path. 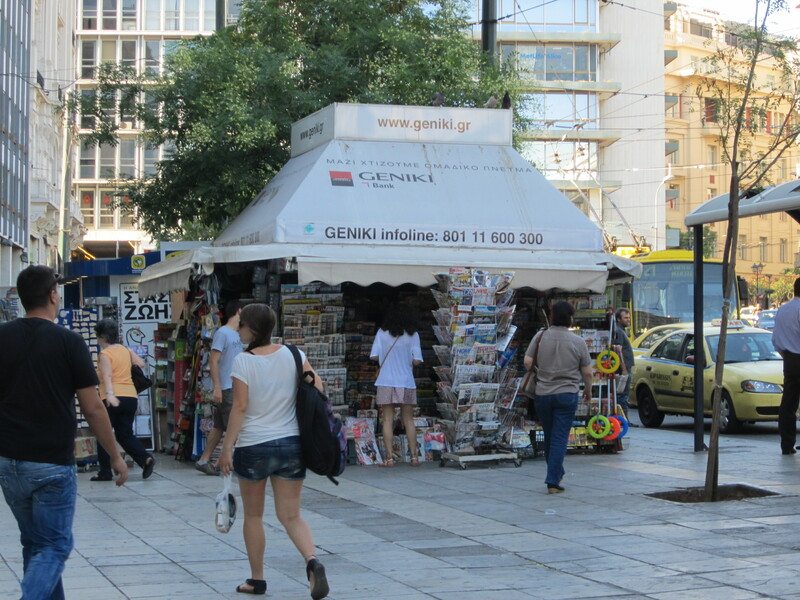 On my first full day in Athens, I spent the day sleeping off some jet lag, walking around the area near my hotel (not much around, but at least a few newsstands that offered cheaper snacks and bottled water than the hotel minibar! ), and then C&D took a half day off so that they could take me outside of the city a little bit. First stop? Vouliagmeni Lake. Now, being an archipelago, Greece doesn’t have many lakes. 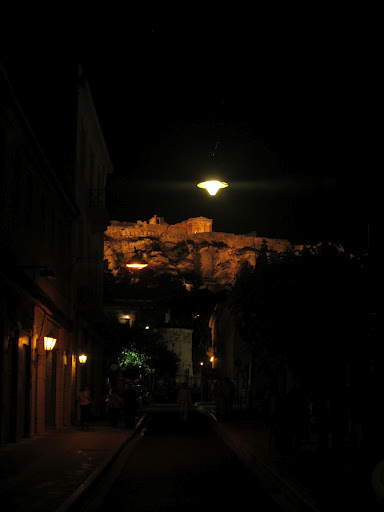 Vouliagmeni is one of them, and is conveniently close to Athens. It’s a nice alternative to the sea, and the water is clear and beautiful. There is an admission fee to enter the beach area, and there are chairs and umbrellas available, so it looked like the perfect escape spot, within a very short drive from downtown Athens. 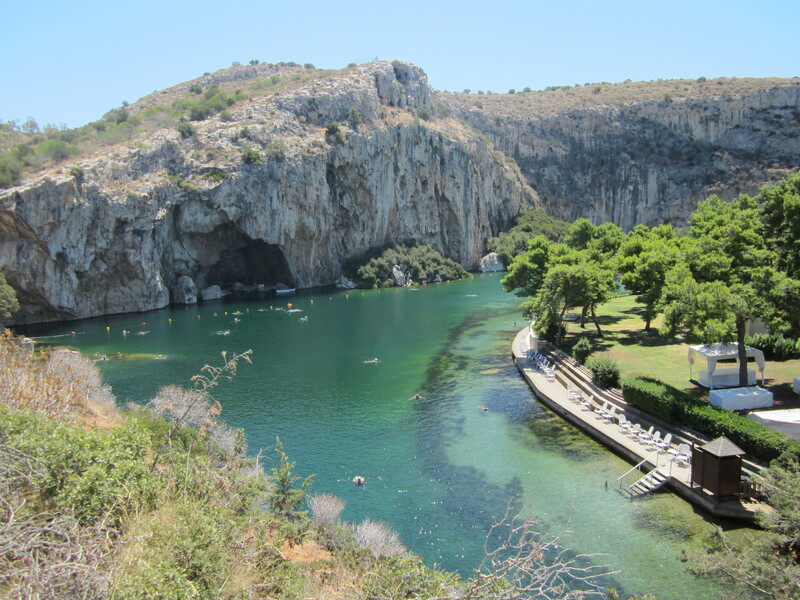 After Lake Vouliagmeni, we got back in the car and drove a bit further from Athens. 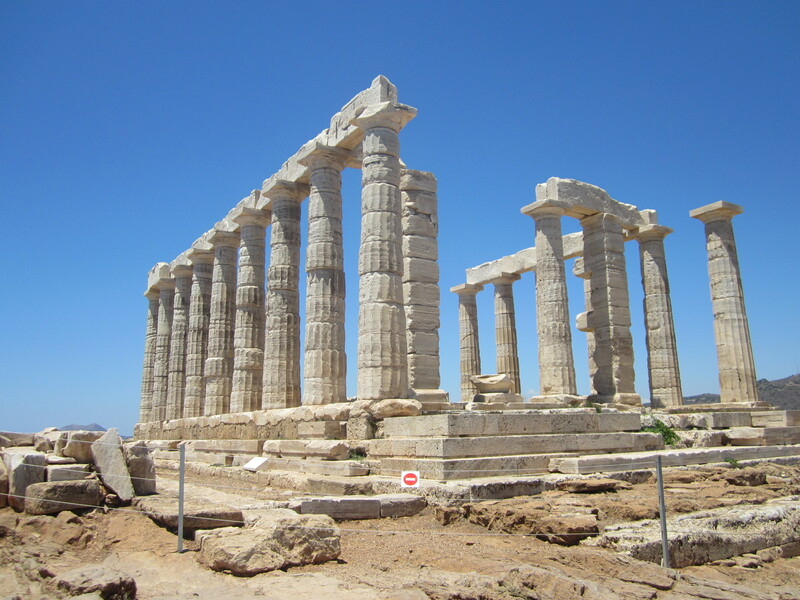 We went to Sounion, where we climbed the stairs in the mid-day heat, and at the top we found this gorgeous site: the Temple of Poseidon. The location, right on the water’s edge & overlooking the sea, is fitting as Poseidon was the Greek God of the Sea. 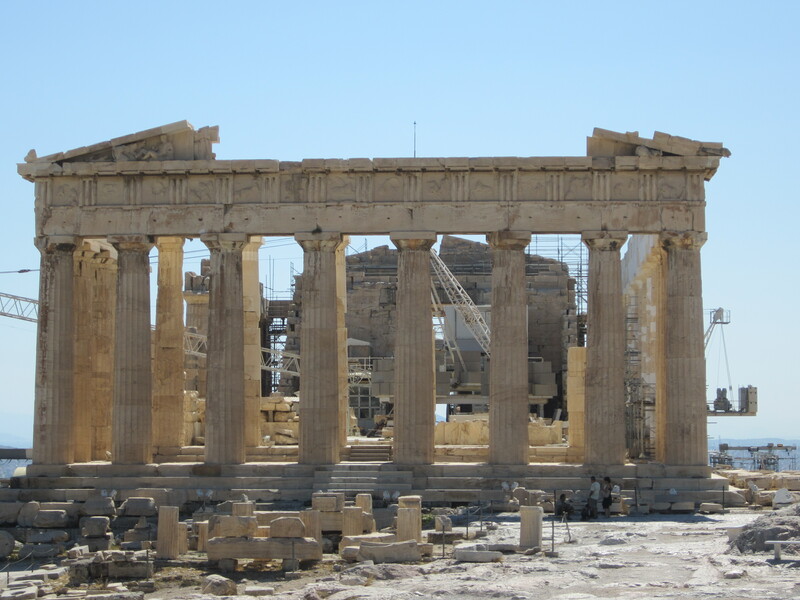 From there, there was one more stop for the day: a stop to get some Greek ice cream…. now, C&D did their best to show me that the Greeks do everything better, and this was a good solid effort. As good as these chocolate & hazelnut ice creams were (and they were delicious! ), I still have to confess a preference for good Italian Gelato over its Greek equivalent. But this ice cream was a close second to the Italian original!! This little guy just jumped right into my lap! 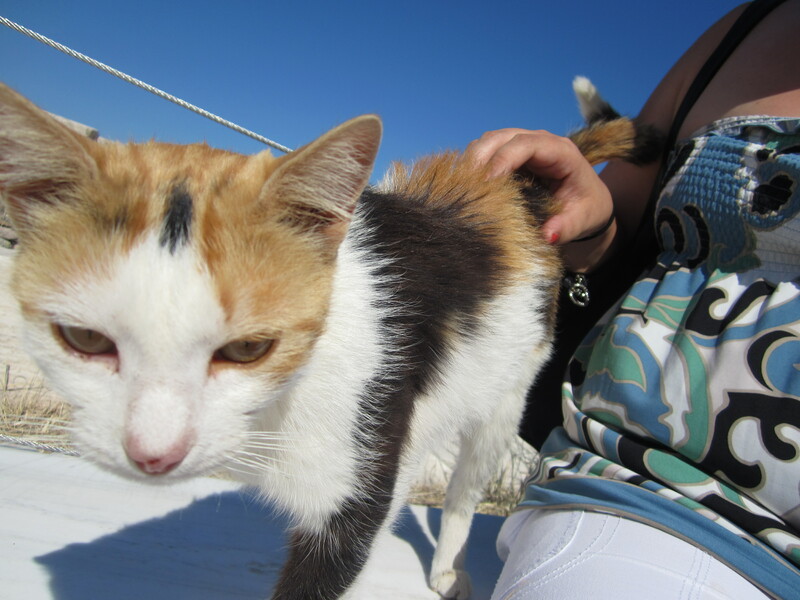 there seemed to be a lot of very healthy looking stray animals (dogs and cats) around, who were very comfortable with people…. sadly, I think that this is a result of the economic problems Greece is facing. 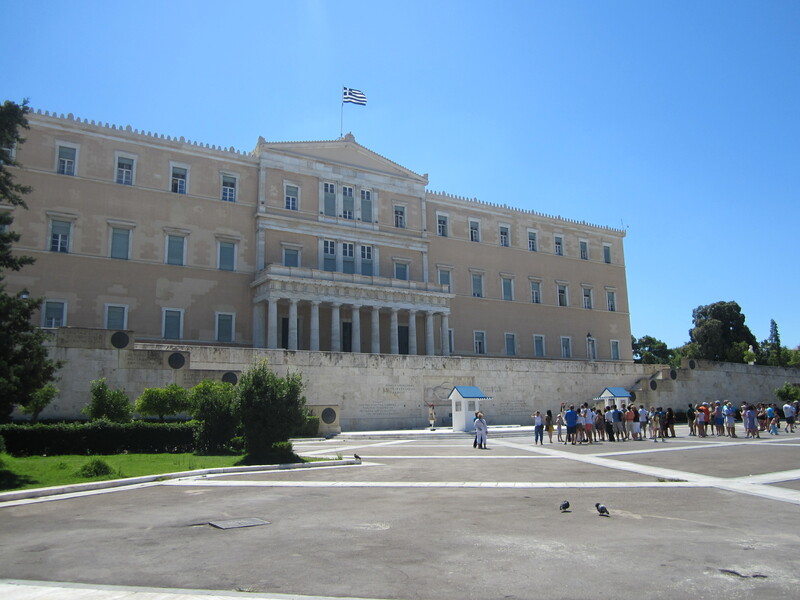 When I went to the Acropolis in the afternoon (by the way, 3pm in July is the wrong time of day & year to go to the Acropolis, with the heat and all the stairs you have to take to get up there!!) a stray cat just jumped right up into my lap, very friendly-like. Unfortunately, it seems that a lot of people are abandoning their household pets as a result of not being able to afford keeping them anymore. Very sad situation for everyone, especially the animals. 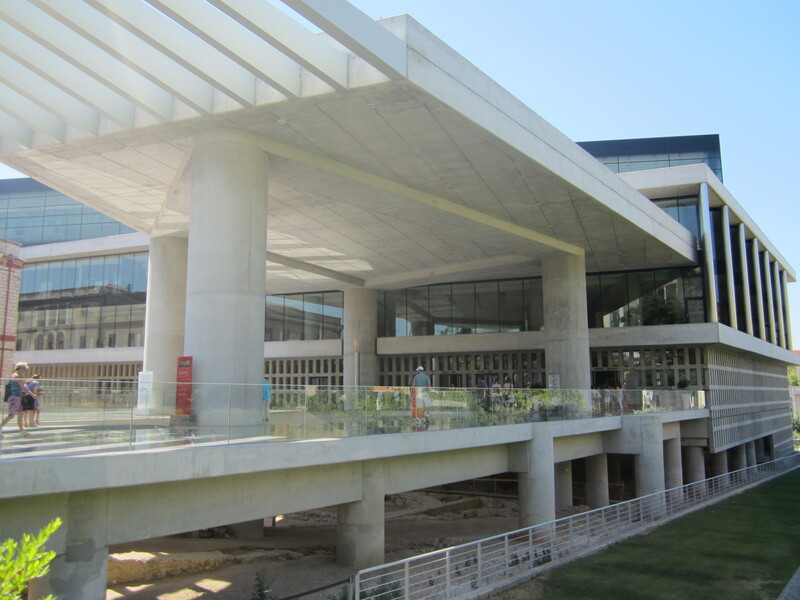 Anyway, once I took the bus around the whole loop, I decided that the first place I wanted to stop was the New Acropolis Museum, which I was told had a great little cafe for lunch. Conveniently, they also had free wifi there, so I wrote a little post from the cafe as I ate. The museum has some pretty cool features, like a glass floor that you can see excavated ruins through, and many artifacts throughout the museum that give a good sense about what the Acropolis must have been like in its heyday. 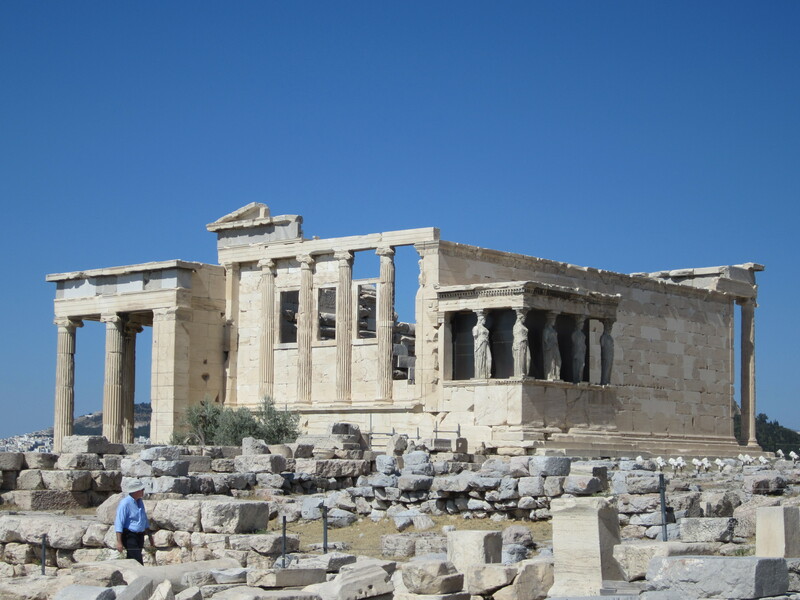 From the museum, it was on to the Acropolis itself. Once again, I’ll repeat…. in July, 3pm is not the right time to go! But a frozen lemonade outside the gates (you’re actually not allowed to bring it inside) is a good way to get yourself ready! Make sure to have water with you to prepare for the hike up the stairs. 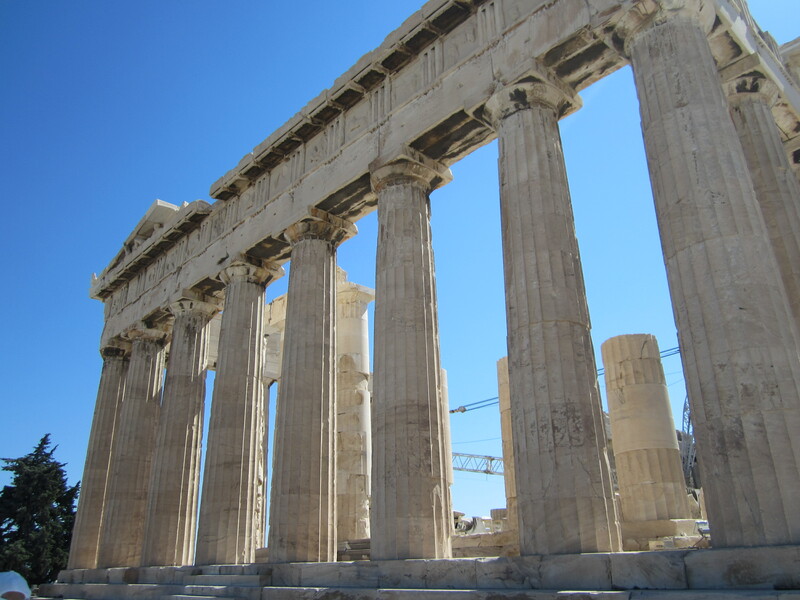 Once you make it up to the top, you’re greeted with beautiful views of the Propyla, the Parthenon, and the Temple of Athena. 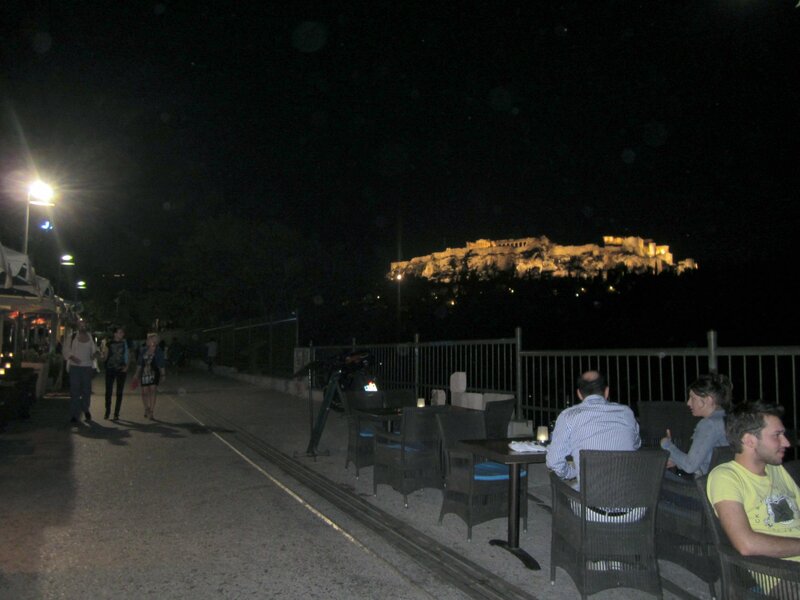 After visiting the Acropolis, it was time for dinner. 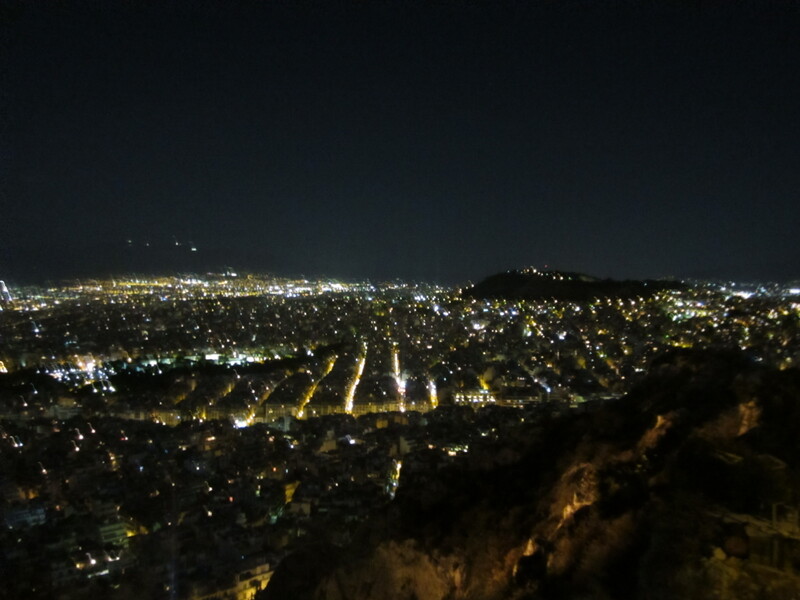 I quickly discovered that the Athens Metro system is easy to use and figure out, so I was able to get across town to go to C&D’s house across town for dinner. A meal in a real Greek home, where they served me wonderful Greek dishes like Dakos and more delicious olives…. the perfect way to end my time in Athens before leaving to go to Crete for my friend’s wedding. But more on that next time. © Travelling Chitalian and Chitalian Travels, 2010-2013. Unauthorized use and/or duplication of this material without express and written permission from this blog’s author and/or owner is strictly prohibited. Excerpts and links may be used, provided that full and clear credit is given to Travelling Chitalian and Chitalian Travels with appropriate and specific direction to the original content. I’ve been absent for some time, but now I remember why I utilized to adore this web site. Thank you, I will attempt and check back more frequently. How frequently you update your site?